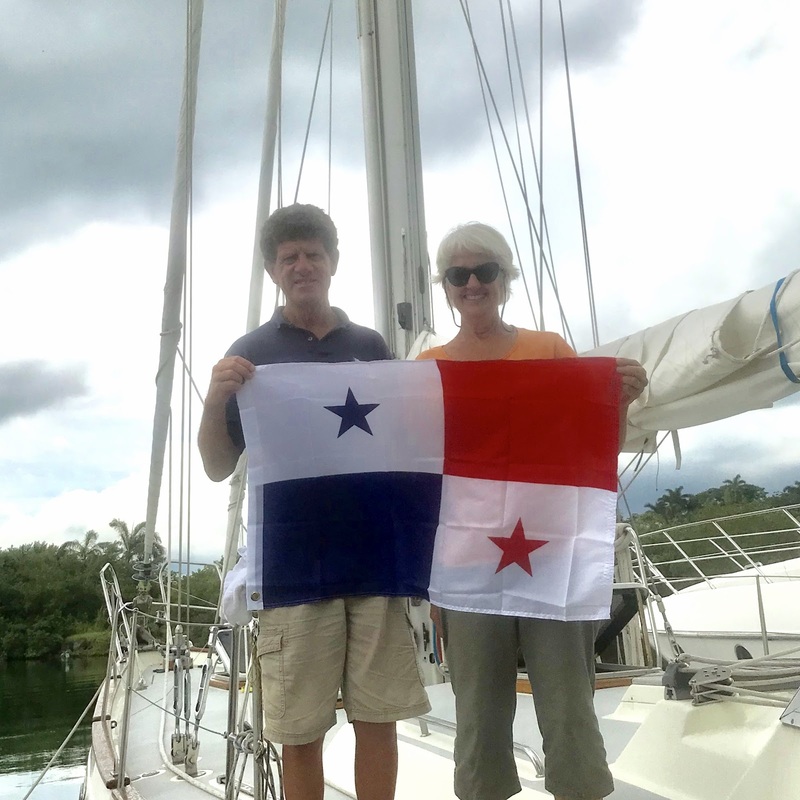 Our approach to Colón, Panamá was both thrilling and intimidating, intensified by occurring at the end of a 4-day passage with little sleep, right at first light on the morning of May 14. We hadn’t seen a fleet of freighters that size since we were in Singapore and maneuvering among them was a true white-knuckle experience. Regulations required us to contact ‘Cristóbal Signal Station’ on the radio when we were within 2 miles of the entrance to Colón harbor and though they were extremely busy, they gave us explicit instructions. Entering right behind us through the opening in the 3-mile long breakwater was one of the mammoth Disney cruise ships, which had to slow down to match our snail’s pace of 6 knots so as not to over-run us. It was a relief to pull into Shelter Bay Marina with its substantial docks, excellent facilities and mill pond-like conditions. They made us a pretty good offer on an extended-stay rate which we accepted and we got started on the long list of projects we wanted to complete before we left for San Diego. Shelter Bay Marina is on the grounds of what used to be Fort Sherman, one of two military installations built by the US to provide security for the Panama Canal. 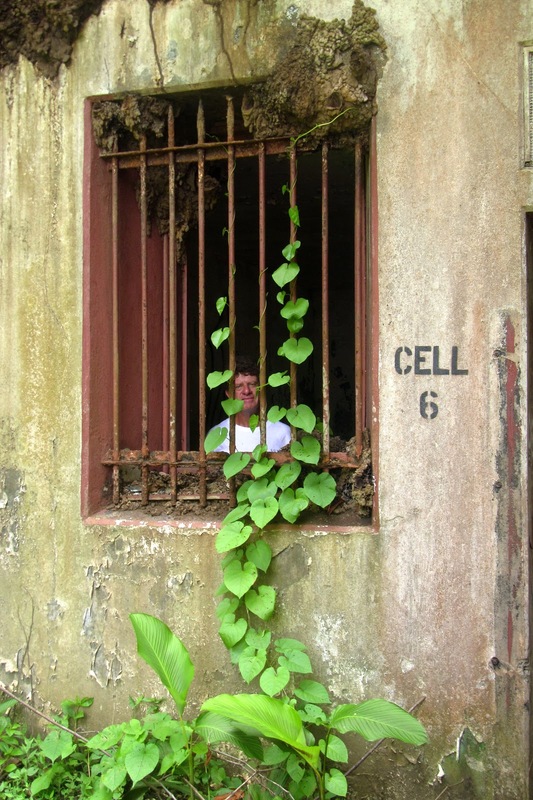 Both installations were turned over to the Panamanian government in 1999 as part of the treaty signed by Jimmy Carter. 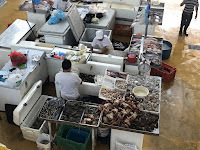 However, the Panamanian government either wasn’t interested or didn’t have the resources to maintain the buildings, roads and other aspects of a large, complex installation and the jungle is a powerful force that will overtake whatever it wants unless a great deal of time and effort is spent to keep it at bay. Wild life abounds in the form of mantled howler monkeys, white-headed capuchin monkeys, sloths, iguanas, crocodiles and lots more. 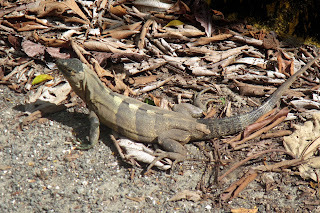 From our berth at the marina, we could hear the howler monkeys. Also near the grounds of Fort Sherman is the UNESCO World Heritage Site of Fuerte San Lorenzo, a fort built in the 16th century to protect Panama’s Caribbean coast. 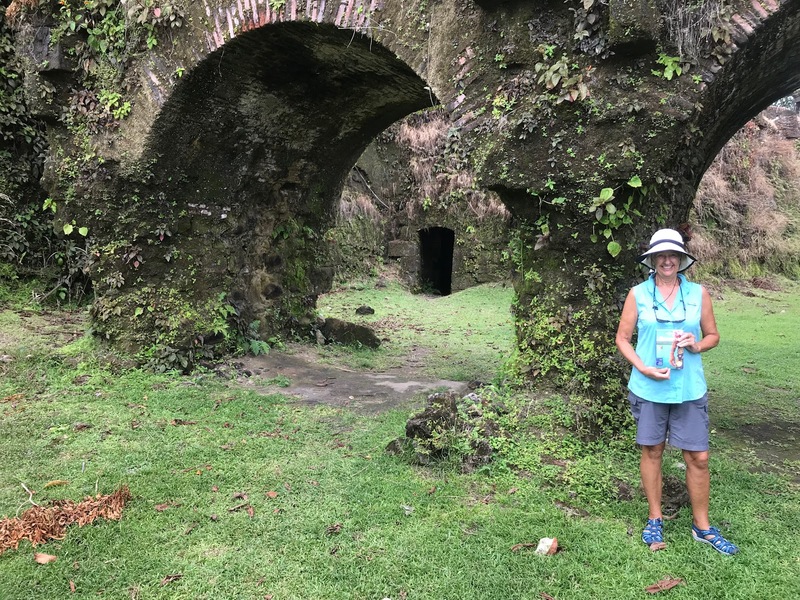 We toured the fort which was fascinating but lost count of how many times it was destroyed and rebuilt (I don’t remember who destroyed it the first time but I do remember that Sir Henry Morgan (of the rum fame) destroyed it the second time.). The majority of cruising sailboats transit the Panama Canal in the December to February time frame and though many slips at the marina were empty, there were still a few cruisers there and they made an effort to maintain a ‘community’. The morning ‘net’ on the VHF radio was expertly controlled by any one of several volunteers and it seemed to have a pretty good level of participation. There were daily yoga lessons, water aerobics in the swimming pool and a weekly pot luck dinner. As with many cruiser communities we’ve become associated with, there were a few people who seemed to be there forever, some that knew everything and some who had nothing to do with anyone. 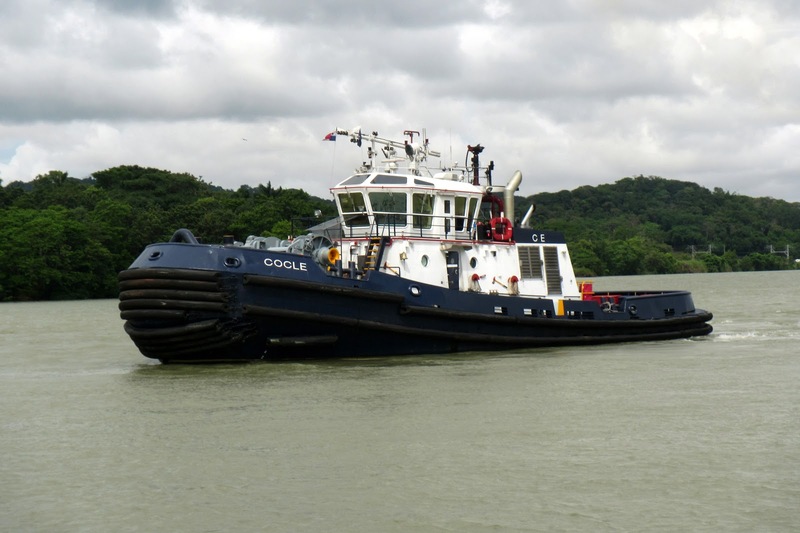 The Panama Canal Authority requires every yacht that transits the Canal to have at least four line handlers and whereas a transiting yacht can always hire professional line handlers, it’s cheaper and more fun to recruit a fellow cruiser who is interested in gaining the experience before they take their own boat through. 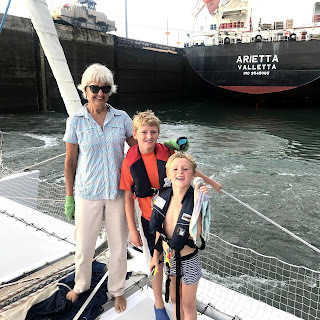 I posted a 3x5 index card on a bulletin board near the marina office that Ruthie and I were available as volunteer line handlers and less than 30 minutes later, there was a knock on Rutea’s hull and there stood Luc, a Belgian who was looking for two line handlers for his 54-foot catamaran. He invited us for cocktails that night and it was there we met his wife, Elaine. Luc speaks excellent English but Elaine not so much and their three young children not at all. 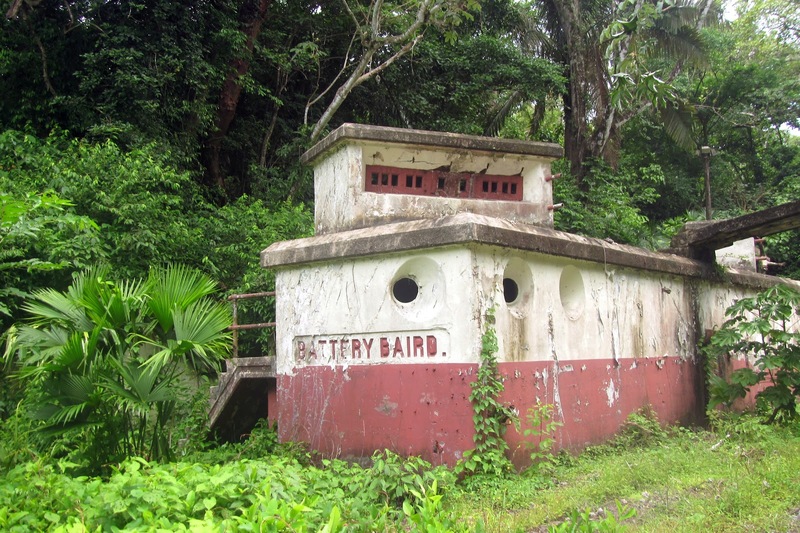 Their transit was to be a single-day, meaning there would be no overnight mooring in Lake Gatun. Since we needed to pick up our Canal Authority-assigned advisor at 0500 at the ‘Flats’, we needed to leave the marina at about 0300. It was hard for either Ruthie or me to get much sleep that night, knowing that we’d have to wake up at about 0200, make coffee and button up Rutea for the day. We were right on time as we were about to step aboard the big cat when Luc met us on the dock. Our transit had been postponed by a day. “Go back to bed,” said Luc. The next morning, at the same time, we cast off the dock lines shortly after 0300 and steamed towards the rendezvous point. Our advisor was right on time and we were just heading into the first of the three Gatun Locks as the sun was rising. There are any one of several configurations that a yacht can be assigned when transiting the Canal. If there are several yachts transiting at the same time, a ‘raft’ can be formed and the outside boats have the required 7/8” lines go ashore where workers place the eyes in the ropes around massive bollards. Another configuration is for the yacht to be against the wall of the Canal and hopefully the robust fenders that the agent provided will keep the yacht from being damaged. A third option is for the yacht to tie up to a tug or work boat that is tied to the wall. The big cat we were on was assigned to tie up to a 60-foot work boat. 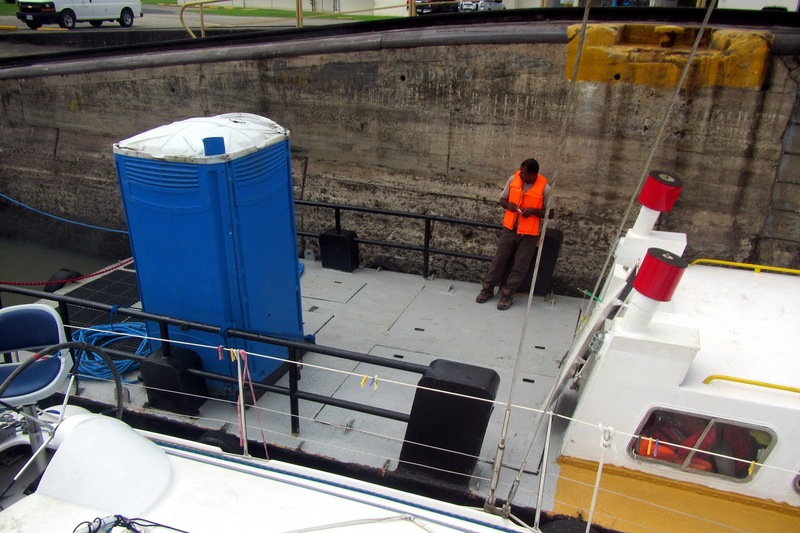 The work boat was kind of a grungy thing and since it didn’t have an enclosed toilet, the owner had opted to rent a ‘porta-pottie’ and place it on the aft deck as Canal regulations require all vessels to have an enclosed head. Besides showing lots of wear and tear, the work boat belched thick clouds of black exhaust from its engines, which were never shut down. Our transit went smoothly enough and was even boring at times. 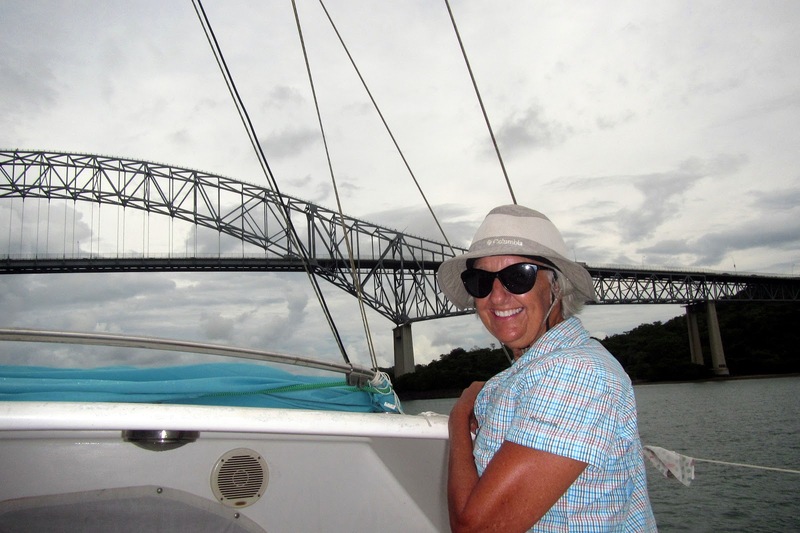 We made it through the final lock and into the Pacific while it was still light and anchored between Isla Culebra and Isla Flamenco. Luc and Elaine offered to take Ruthie and me out for dinner but the children were already falling asleep, so we requested they just take us ashore. They insisted, though, woke the children and all of us piled into their small dinghy for a wet ride into the dinghy dock. We had dinner, found a nice hotel, said ‘au revoir’ to Luc, Elaine and family, got a decent night’s sleep and took a bus back to Colón. The next couple of weeks where whirlwinds of activity aboard Rutea as we prepared her to sit patiently in her slip while Ruthie and I returned to San Diego. We were able to find a cruiser who was willing to look in on Rutea and that gave us a little piece of mind that if something were to happen, at least we’d know about it before we returned to be surprised. We left Shelter Bay Marina and Rutea in the early morning and shared a cab with a cruiser who had business in Panama City, about an hour-and-a-half drive away. We checked into the squeaky clean Hotel Coral Suites and even though we were there well before check-in time, they showed us to our spacious room. 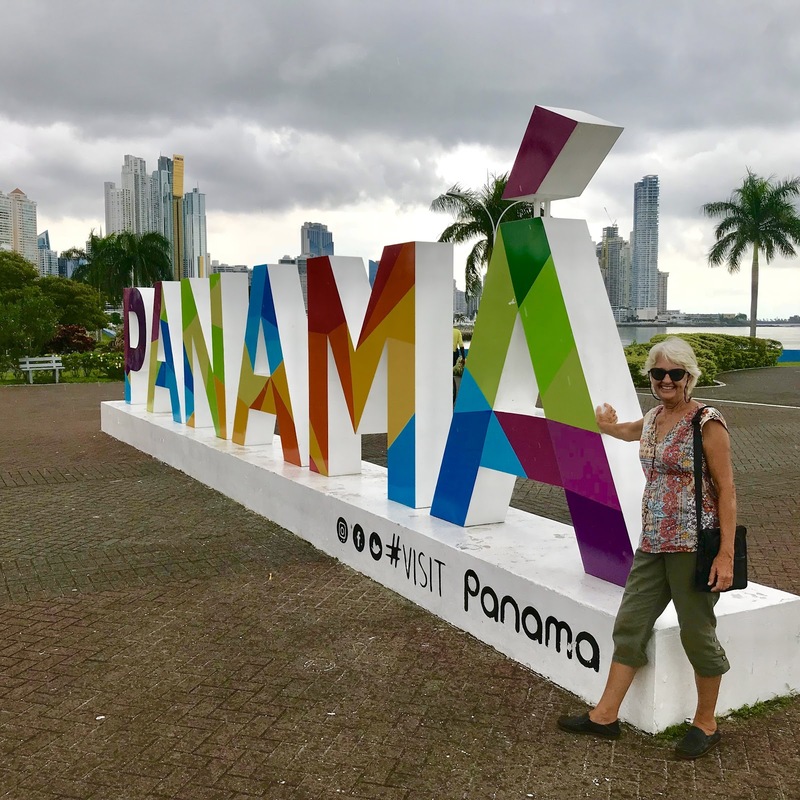 Armed with a copy of Lonely Planet for Panama, its top edge fluttering with bits of paper marking important pages, we set out to discover this city whose skyline resembles that of Miami Beach in Florida. As per usual, Ruthie and I walk everywhere and, fortunately, Panama City is mostly very flat. That didn’t stop me, though, from working up enough perspiration to completely soak my clothes, the tropical heat and humidity continuously torturing me. One of the highlights of our tour was visiting the old part of Panama City, which, like many cities, has undergone revitalization and now hosts trendy shops and tony eateries. We easily spent three hours in the museum on the building of the Panama Canal, the saga of which almost reads like a fictional murder mystery. 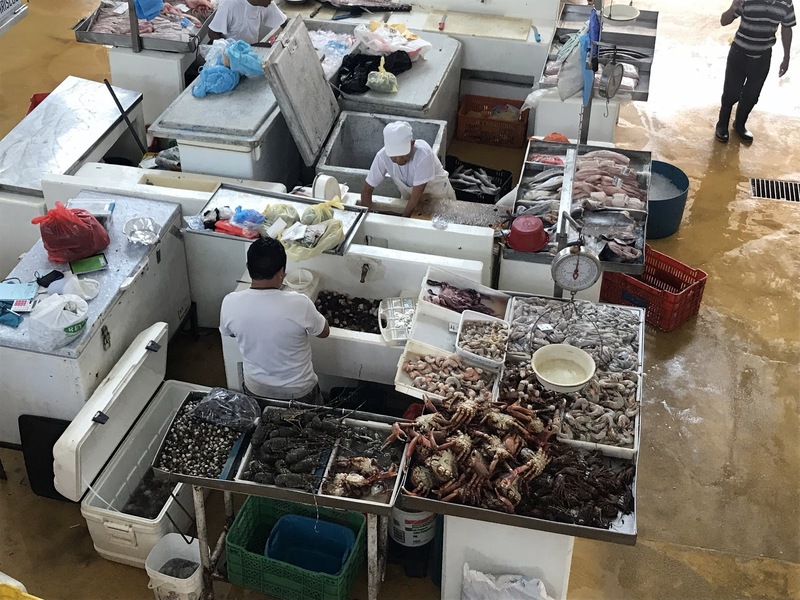 For lunch, we walked back to the fish market, a massive facility for both wholesale and retail seafood sales, complete with many restaurants and stalls. That evening we got together with a cruising couple we had met at Shelter Bay Marina (who were also leaving their boat and heading home) and after cocktails in our room, we walked to a restaurant with a dinner show featuring traditional Panamanian folk dancing which was far from professional but had much in the way of effort, dignity and pride. We all felt it was very worthwhile and the food was pretty good, too. Then, one more time, Ruthie and I boarded a plane for home, knowing that probably it would be the last time we’d leave Rutea in a foreign port and fly home.